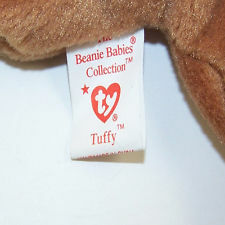 There was not much change from the 5th Generation Beanie Babie Tush Tags compared to the 4th Gen versions. The two changes were a ® symbol that was added to the “Beanie Babies” in the The Beanie Babies Collection line. Also, the 5th Generation Beanies once again have the name of the toy on the tush tag. The change from the 4th Gen Tush Tags is that on the 5th Generation versions after the name of the Beanie Baby a ™ was added. Very few Beanie Babies with a 5th Generation Tush Tag are worth many. Very, very few. This is the mass produced era of Beanie Babies and collectors tend to want the 1st and 2nd Generation Tush Tag Beanies or ones that are much more rare. For example, a Goldie The Fish with a 5th Generation Tush Tag that was even authenticated by True Blue Beanies only sold for $8 on eBay in June 2013. A 1st Generation Tush Tag Goldie The Fish would sell for over $100+.